Every parent wants to help their children grow up to be healthy, but kids don’t always cooperate when you’re trying to get them to eat healthy food. My biggest struggle right now is a baby that loves fruit and will refuse to open her mouth for vegetables. Being 6 months old, it’s a little hard to reason with her… Well, I think we finally found a baby food that is not only good for her, but she loves it! 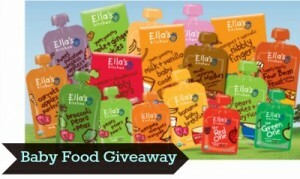 Ella’s Kitchen Organic Baby Food is just what we were looking for! They sent me some to let Sarah try and we are both really happy with it. For her, most flavors have a fruit mixed in. So instead of Spinach and Peas, it’s Spinach, Pears and peas. 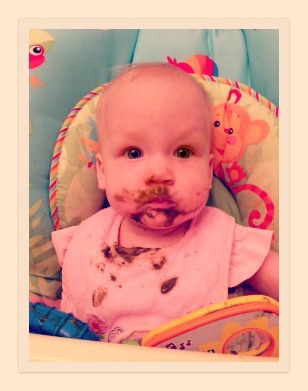 It’s funny how much in the baby food world has changed in the last 5 years since our middle child. Everything is in pouches and so many more choices!! I’m in love with the new pouches, once a friend showed me the wonderful spoons you can screw right onto the top! Don’t take my word for it, here’s a shot of spinach, pears and peas. It was very loved, and a little messy! Ella’s Kitchen’s mission is to develop healthy eating habits that last a lifetime by providing a range of tasty, natural and healthy 100% organic foods for babies and kids. Ella’s Kitchen Organic food is sold in three different stages, and there’s even a category for special diets. “Ella’s 1” is baby food for 4+months, “Ella’s 2” is baby food for 7+ months, “Ella’s 3” is toddler food for 12+ months and the “Special Diets” have options for Gluten Free, Lactose Free and Vegetarian. Their online store isn’t quite up and running, but in the meantime you can buy from Amazon. 5 Southern Savers readers are going to each win a pack of 10 baby food pouches. Leave a comment below telling me which Ella’s Kitchen Organic flavor you want to buy for your little one. This giveaway was sponsored by Ella’s Kitchen, but all opinions are 100% my own. The winners of this giveaway will be chosen and posted to the Giveaway Winners Page Wednesday, 5/22.